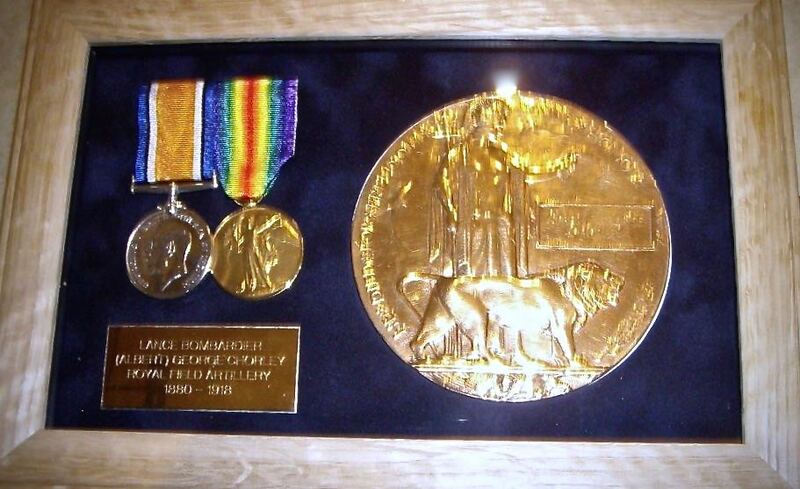 In early November 2018, the medals and Death Plaque of Lance Bombardier (Albert) George Chorley were offered for sale on eBay. George Chorley is listed on the Village War Memorial. He was born and brought up in Fivehead, worked at The Old Bakery and was a prominent member of the Fivehead Baptist Church. He enlisted in the Royal Field Artillery in 1914, and served throughout the war but died of his wounds after the Battle of the Aisne in May 1918. Oliver Howard and Pip Brett initiated a crowd funding campaign via the village email, to see if there was any interest in buying the medals and, if so, whether we could raise the necessary funds. The response was fantastic: £270 was raised in a matter of hours, so we bought the medals and have now had them restored by the Bigbury Mint. They will be displayed in the Village Hall in the New Year. We would like to thank all those who donated for their generosity and timely responses. As a number of people donated anonymously, it is not possible for us to thank you all individually.